A drawing of an early steam-powered menhaden purse seiner from The Men All Singing. The Atlantic menhaden (Brevoortia tyrannus) is without question one of the most common fish in the coastal waters of the East and Gulf coasts. This relatively small fish, generally not exceeding two pounds in weight, is found in huge schools that number in the millions of individuals. Also known as pogy and mossbunker, it is a very oily fish, a characteristic that today* rules it out as a food fish but makes it ideal both for use as bait in other commercial and recreational fisheries and as a source of high-quality protein meal used by fish, poultry and other livestock farmers in New Jersey and throughout the United States. * In The Men All Singing (referenced below) Mr. Frye quoted G.B. Goode in an earlier book that menhaden were “a staple article of food among the people living on the sea-coast of New Jersey” and were “in good demand on the shores of Chesapeake Bay" and that in 1874 they were being sold in the Washington fish market at a price nearly as high as that of striped bass. Menhaden being found in dense, compact schools, purse seining has been the accepted method of harvesting this valuable and plentiful species for well over a century. It is employed in a fishery that extends from Maine to the Gulf coast states. The migratory habits of menhaden also made them fair game for pound nets when they were in common use. These were large staked nets extending out from the beach and trapping fish as they migrated along the coast. In his book The Men All Singing (1978, Donning, Virginia Beach) John Frye traces the history of the fish, the fishery, and the industry that was built around it back to colonial times. Since the first Europeans came to North America the vast schools of menhaden have been looked upon as a valuable resource. For well over a hundred years they have provided jobs for people in coastal communities where there were few other employment opportunities. One of the larger businesses involved in the fishery, Seacoast Products, had its corporate headquarters, a large processing plant and a fleet of purse seiners in Port Monmouth, New Jersey. Today the menhaden industry is a significant provider of union jobs both ashore and on what are known as the “pogy” boats. For most of its long history the menhaden fishery has been plagued by periodic attempts of various groups to force it out of particular areas. These were sometimes aimed at the processing plants, which are not always considered the best of neighbors, and sometimes at the harvesting vessels, which are generally assumed to either catch “all the gamefish” in an area or “all the gamefish’s food” and forcing them to forage elsewhere. As a response to what must be these latter concerns, legislation has recently been introduced in the New Jersey Senate to drastically restrict menhaden fishing in state (out to three miles) waters. In support of this legislation, materials purporting to be factual and science-based have been circulating at yacht clubs, at sportsfishing shows and in the legislature in Trenton. Unfortunately, those materials that we have seen contain little or no documentation or explanation of the “facts” they contain. They present what seem to be little more than anti-commercial fishing sentiments as accepted science. The documented information we’ve compiled here isn’t to refute any of the claims made by them. Rather, it is material we hope will fill any gaps that our sportsfishing and yachting colleagues might have somehow overlooked in their zeal to turn New Jersey’s coastal waters into their own exclusive playground. We have every confidence that anyone taking the time to objectively review what we’re presenting will be capable of making an unbiased evaluation of the menhaden fishery as it exists today and of the effectiveness of the existing menhaden management system. Does menhaden fishing affect the recreational catch? Anti-commercial fishing activists have been claiming for years that menhaden purse seining interferes with sportsfishing. The National Marine Fisheries Service making both recreational and commercial fishing statistics available via the world wide web, we decided to look at the data. We downloaded the annual commercial menhaden landings and the recreational bluefish, summer flounder, striped bass and weakfish landings for New Jersey, New York and Delaware for the years from 1986 to 1996. We selected the four “recreational” species because they are the most popular angling quarry in the inshore waters inhabited by menhaden. We used commercial menhaden landings and total recreational catch. Looking at this “official” data, there doesn’t appear to be any evidence that menhaden landings are having a negative impact on the catch of the sportsfishermen in New Jersey’s waters or in the New York/New Jersey/Delaware region. One of the most enduring misconceptions about the menhaden fishery is that the purse seining boats with their extensive nets must catch and kill innumerable other species along with their targetted harvest. In fact, the menhaden fishery has repeatedly been shown to be among the most selective of the large-scale fisheries. It was a New Jersey agency, the Department of Conservation and Economic Development, that determined in 1968 that 99.6% of the menhaden purse seine catch was made up of menhaden. This was via a two-year study, Evaluation of the Menhaden Fishery in Delaware Bay, undertaken because, as stated in the introduction “Members of the New Jersey sport fishing community had accused menhaden boats of taking large amounts of sport fish and oysters....” It goes on “Accusations of this type are nothing new. The 1905 annual report of the New Jersey Fish and Game Commission tells of complaints made by certain sport fishermen and summer residents which included... catching and/or scaring away sport fish.... These accusations... are basically the same ones which periodically have arisen since that time and still persist today.” Ironically the descendent of that agency, the New Jersey Department of Environmental Protection, seems to be sitting on the sidelines during this present iteration of a chronic conflict that could have been settled a generation ago. Of more recent vintage is the anti-menhaden harvesting argument that taking fish that are an important part of the marine food web will cause the predator species that eat them to either starve or to move to “greener pastures.” Again going to the literature, in 1977 in Menhaden, Sport Fish and Fishermen (in Marine Recreational Fisheries) researcher Candace A. Oviatt concludes “...even when menhaden abundances are so low that it is not commercially feasible to catch them they are still sufficiently abundant to be a primary food source for predatory fish.” Even more compelling than the literature, however, are the actual menhaden and sports fishing landings in New Jersey over the last ten years. 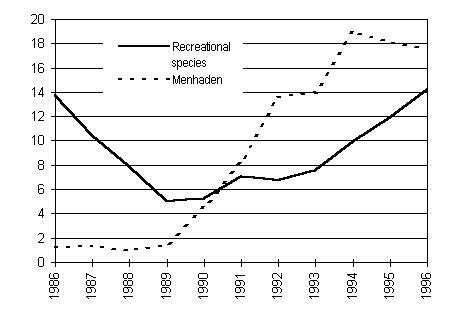 As explained in the box on the previous page, there is no sign that the recreational landings of the species most likely to be impacted by a lack of menhaden are doing anything but thriving, with their combined landings increasing from year to year along with the menhaden harvest. Finally, the anti-menhaden fishing groups and individuals would have us believe that the menhaden fishery is currently undergoing an unprecedented and potentially ecosystem-shattering period of expansion. 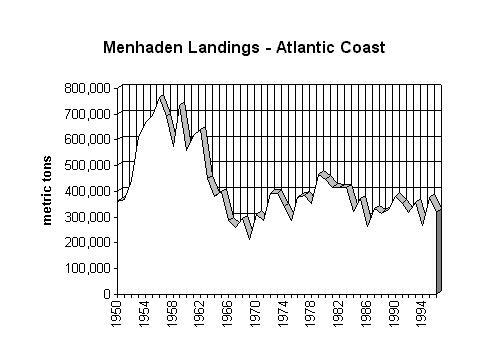 As the chart of Atlantic coast landings from 1950 to 1996 ( for coastal landings data) illustrates, nothing could be farther from the truth. In fact, coastal landings of menhaden today are barely half of what they were in the middle Fifties, those “good old days” that so many of our recreational fishing colleagues look back on nostalgically. So, minus any measurable or even hinted-at impacts of today’s reduced levels of menhaden harvesting on sports fishing, and looking at a valuable fishery being accomplished at what is undoubtedly a sustainable level when considered in any kind of historical context, why the concern with commercial menhaden harvesting? With every “new” anti-commercial fishing campaign it seems more apparent that there is an ongoing movement to reserve our coastal waters - and our fisheries resources - for the exclusive use of a small group of privileged sportsfishermen and yachtsmen. These people, who are fortunate enough to be able to spend tens of thousands of dollars and upwards - sometimes upwards into the stratosphere - on their sports fishing boats apparently don’t want their hobby or “their” ocean cluttered up with working fishermen, fishermen who have the gall to want to catch the same fish or use the same piece of water that they do - and then to want to share their harvest with the public. The professional fisheries managers have heard all of the anti-commercial crowd’s specious and self-serving arguments before and, having the science at hand to refute them, aren’t swayed. That’s probably why legislation is now the anti-commercial fishing tool of choice. But postcards and constituent complaints don’t alter fifty years of data and won’t make unjustified restrictions on working fishermen - or on the businesses they support or the markets they supply - any more acceptable. We have an expensive and increasingly effective fisheries management system based on real science. Don’t we owe it to the entire public to let it work the way it should?